On Wednesday, Nov. 5, NBA shooting guard Dion Waiters was in the locker room and not standing with his Cleveland Cavaliers teammates for the playing of “The Star-Spangled Banner” before their game against the Utah Jazz. It would be reported later that Waiters cited his renewed religious faith as a Muslim as the reason why he sat out the national anthem. Days of denials and clarifications followed as Waiters found himself nearly caught in the middle of a polarizing American sports controversy. Meanwhile, as Waiters was absent for the anthem in Utah, another Muslim NBA player was standing on the court that night with his hand over his heart, somehow inconspicuous despite his 6-foot-11, 245-pound frame. 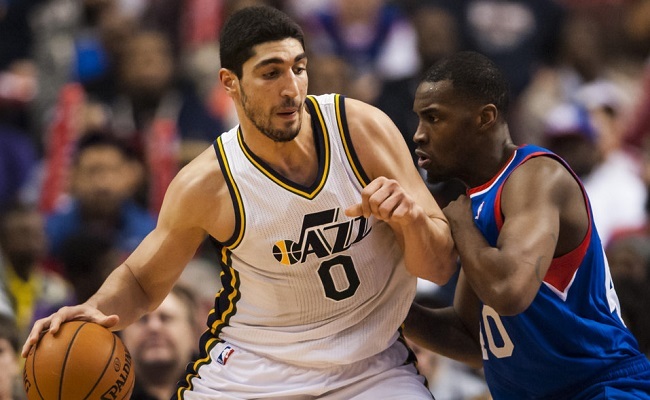 Jazz center Enes Kanter is a Muslim from Turkey. The No. 3 overall pick in the 2011 NBA Draft is averaging 12.8 points and 6.0 rebounds this season, and at 22 years old is considered one of the young building blocks for the future of the Jazz franchise. Over the weekend, Kanter addressed the Waiters incident. Kanter also posted a photo of himself standing and saluting during the national anthem at a recent Jazz game. Kanter typically tweets in Turkish, but for this series of posts he used English — obviously aware that his words would reach more Americans, more NBA fans and more media members that way. Perhaps his goal was to help put the Waiters controversy to bed. It has been written how seemingly none of the mainstream media covering the Waiters story bothered to ask a Muslim scholar, an imam, a Muslim community representative or an organizational spokesperson if Islam actually teaches Muslims not to stand for national anthems. It’s equally interesting that seemingly none of the mainstream sports media covering the Waiters story bothered to ask a Muslim NBA player for their view — even when Waiters directly crossed paths with two of them: Kanter and Denver Nuggets forward Kenneth Faried, who played against Waiters and the Cavs on Friday, Nov. 7, the day the original report was published. Even if Waiters did skip the anthem due to his Islamic beliefs, which he denies, getting the opinion of a Muslim player who does stand for the anthem would seem logical in the name of balance. As impressed as I am with Kanter for choosing to honestly weigh in on a sensitive topic unprovoked — something we don’t see enough from today’s athletes — I am equally impressed that he used his notoriety and his social media platform in an effort to help Waiters, his brother in Islam.